And if they were alive, but stuck in some radioactive wasteland...well, that wasn't exactly good news either.Strangelets had me curious from the moment I read the description and saw that a group of random and unconnected people on the brink of death were going to wake up somewhere else unknown. I knew that they couldn't be in purgatory because of the futuristic nod, but I was very curious to know what the deal would turn out to be.I loved the first half of this story. We start off with everyone suddenly appearing, then meeting each other, in this facility which had a creepy mental hospital vibe. All of the characters had their own unique story, and I was absorbed in trying to find out how they could be connected. I hardly had any time to read over the weekend, but I found myself sneaking in a few pages here and there because I wanted to know what was going to happen next.Then I got smacked in the face with a bunch of other stuff I wasn't expecting. There isn't much of a way to explain what is going on, but little snippets of the environment reminded me of a jumbled version of The Mist (which part I won't tell because it would reveal too much), Unraveling (more for the technology), and (I'm stretching here with this last one) Jurassic Park. The second half wasn't as exciting but the end had me nodding in that "I see what you did there" kind of way. For a stand-alone book, I think the story strained a bit at the seams with trying to go from start to completion while incorporating all of the necessary information in one package. People who want to tie everything back to a root idea which seems believable might struggle somewhat with the concept. 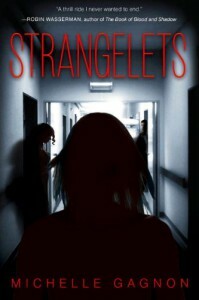 But on the plus side, Strangelets got me to root for the characters to find some answers and get to a better place, so the book did serve its purpose from an entertainment standpoint. I don't think the romance element was even needed in this story but it did add a sweetness to the outcome, so I guess that's not necessarily a bad thing. Readers who are looking for a non-dystopia sci-fi and prefer a single volume book over a series might want to check this out. This book provided from the publisher through Netgalley in exchange for an honest review. As this was an advanced reader copy, quotes may be changed or omitted from the final copy.